Jesse Prince Much links, hopefully someone else takes a little time to find out if there is a disconnection story. Can't quickly find a link of disconnection for the following. Please try and find yourself. Mark C. Rathbun - Maybe his first wife? I think she was on Anderson Cooper. Divorce could also have been for another matter then disconnection. I think it would be good to focus on consolidating what we have right now. Incred, the names at 1 are for you Maybe you can also do something with 4? Would be nice to have. The links below 3 are for later searches. I also think that when the lists W-Z I have done today are added it will be a good moment to try and have some announcement. Thoughts? More than willing to help, but I don't want to do double work. If you want that chunk to be my project cool. But I don't want to start doing all this work if many others are trying to research the same thing. I will leave #3 and 4 for someone else. WHOA! 248 entries now. Very nice! I'll give the announcement a go. It's quite possible given the date that both these people are dead so we probably won't find the outcome of this. Having said that, I'm happy to add Randolph Frank's name (as the person being disconnected) with this link if you are. This brings up the question of disconnection stories involving people now deceased. They obviously can no longer tell their stories, but can their relatives tell their stories for them? #249. Yes, please add Frank's name. It helps to get the total over 250. I tend to say yes. I also added Mike Rinder's story about Kirk Radandt. I will start on 3 later this week, or maybe next weekend. Wouldn't want this to become a daytime job. I already have one that pays my bills, which I think is more important. For you personally what was the hardest part about leaving? Well, the hardest part was leaving my wife. I spent the last 10 months attempting to sort of reconcile the fact that I had to go because of the extremity of abuse that was going on. She was a second-generation Scientologist and she chose to stay. #251 I say yes, because he says the his divorce was a consequence of his choice to leave COS.
ETA: I thought I now get to assign the numbers, so edited my posts. As far as the Schlessinger vid, nothing there, but since Karen interviewed her, maybe ask her to ask Jillian herself? I also read a post from 2 years ago in a comment that said that SP declares have disconnections clauses now? May find something on someone's declare? Remember Anon Sparrows vid and his SP declare that he was handed and the person delivering it to him in front of the DC org said he wasn't allowed to talk to anyone any more. If this is the case about the SP declares, then anyone who was handed one in the last two years would be a victim of disconnection per the cults clause on the declare? "Scientologists who are declared suppressive can get back in good standing by accomplishing the “A to E steps” of a program of contrition and reindoctrination. Until that time, the suppressive may only communicate with the International Justice Chief, who determines if the A to E steps are being properly fulfilled." It wasn't Kevin's video, it was Tommy Gorman videoing Kevin's brother and talking about Kevin to him. "After nine months of staying at Williams' apartment, Stewart finally told Gorman what had happened: According to court documents, she alleges Williams forcibly raped her more than 100 times, threatening to kill her if she told anyone. Stewart says she was terrified that if she reported him, she would be declared an SP and her family would disconnect. Gorman says he called Quiros the next day, who told him not to go to the cops." do you have the audio of Sylvia DeWalls? Where she is labeled suprressive? Sylvia is already listed with that link. do you have this vid? Yes that's there too. Please check http://whyweprotest.wikia.com/wiki/...onnection_Policy_by_Former_Members_and_Others before asking. So far now we have a no for her. I'm afraid I don't exactly understand the consequences here because I fail at English? For now I'm sticking to finding stories about actual people. I am however willing to change POV, so I'm asking for other opinions. Hey Incred, question. Would it be easier for you if I posted new entries like this? I think this more resembles the code you have to write to get a good wiki entry? I agree, we need to stick to specific accounts of disconnection instead of the implied kind from SP declares as that would just open up the floodgates to every declared SP being added by default which is not what the list is about. "Ihave also been subject to disconnection. I received some handwritten notes, penciled on lined paper, from two different friends. Many erasures and rewritten wording. I wonder if the process of disconnection occurs in the ethics office or MAA’s office where they write these? Do other SPs have the same type of penciled disconnection notes from dear friends? I wasn't gonna say anything as I'm used to manipulating strings between formats manually, but YES! Do you have Natascha Kobitzsch? Yes that's there too. Please check http://whyweprotest.wikia.com/wiki/Accounts_of_Scientology's_Disconnection_Policy_by_Former_Members_and_Others before asking. WTF? How do I keep a YT link from expanding? done for today, wrist is aching. This week (or maybe last one) Tory had a new vid out where she once again showed her declare, and that one also said her only contact in the church is the IJC. So that is nothing new. By the way Tory called and asked for him, but it looks like there is no IJC at all. yes I know. My point is, if COS says that is the ONLY person you can communicate within the COS(whether he exists or not) then that they are telling you that you are cut off from others = disconnection. So in fact, anyone who is declared is a victim of disconnection by church standards. Same here. I guess it's them mean body thetans saying I must go do something else than destroying a cult. I sure as hell thought I was going to get rickrolled. I now see I forgot this one in the big roundup post above. Please someone try and find if there is any story there. I for one will today mostly be sitting on my couch and being lazy. /r/ similar for the new page. Do people forget that it's already linked in the menu or something? Like Achmed the dead terrorist: I can do this crap too! Another example of what I mean about being declared an SP. People whop are declared can not talk to staff any more, their auditor and anyone else in the org they belonged to. You have to remember that people in the COS get very close to their auditors! Their twins and many more! I wonder if there should be a mention in the intro for the Disconnection List? Any former members of the COS who were declared a suppressive person is a victim of disconnection in some form. Because it is true. They can never talk to those people again. It's not going to say this? Any former members of the COS who were declared a suppressive person and received an SP declare (or not) is a victim of Scientology's disconnection policy in some form. Maybe hit ctrl-F5 to have the browser reload the page? I have to say I wonder a little why this looks so important to you. Personally I don't care about SP declares. This may sound strange, but these things are - AFAIAC - only pieces of paper. It's the effect that they have on people's lives that are horrible and devastating. So I would like this list to be about real people and their stories of how they suffer(ed) under it. Say, I join the COS with my wife. We don't see fellow COS people as friends, at most as people of the same faith. With all other family and friends we have relations on a fair roads good weather basis. Then, for some reason we get declared and get the goldenrod. We decide to get out together. Would we be a victim of the policy? I think not. This is only a short theoretical exercise to show that - IMHO - SP declares and what they say should not have the focus. A lot of them say made up things anyway, and ever since people started posting them on the net the church no longer actually gives them. At most you get to see them shortly. Maybe you can explain? I really have a hard time understanding. While as of the last count, there are 257 names on this list, you may want to see the big list of all Former CoS members who have spoken out, because disconnection is generally an ever-present menace for everyone involved as the consequence of being declared a Suppressive Person by the CoS.
oh I didn't see this at all. Using other words to the same effect is fine with me. *I have to say I wonder a little why this looks so important to you. Say, I join the COS with my wife. We don't see fellow COS people as friends, at most as people of the same faith. With all other family and friends we have relations on a fair roads good weather basis. Then, for some reason we get declared and get the goldenrod. *We decide to get out together. Would we be a victim of the policy? I think not. It's important because the general public should know if you are declared and SP in the COS, then you are a victim of disconnection. Anyone who belonged to their local org became friendly with everyone in it. Including their auditors, other staff that worked there ect.. They went to functions with these people, if their kids were friends with other member's kids and they hung out together that is ended. This also includes businesses that these members went to owned by other Scientologists, and other celebrations they attended with these people. That ALL goes away. Their FB friends go away too. Regardless if the SP declares are useless pieces of paper or not, for those still "in" it still carries a lot of weight, which is why they have to disconnect or be labeled PTS and then they will also be declared if they continue the relationship with that SP. Even if the COS no longer hands the goldenrods out, just being "declared" is enough for people to disconnect from you. Everyone in Leah's family lost friends and relatives to disconnection. Her daughter Sophia lost friends and cousins. Leah lost FB friends over night. Just like everyone else who has been declared. They ALL suffered some form of disconnection whether they told their story in public or not, and the general public should know this. It's also another kick in the pants to the COS. They can NOT dispute that these people can go back into their local orgs and talk to people either. Look at the case with the Garcias! Every now and then the language difference and the fact that I am so focused on technical aspects like finding names etc makes that I fail to see the bigger picture. I then somehow don't get a grip of the vast influence it has. I hope I am making sense now. yes you two would still be victims if you left. I think the bold part still may give the impression that we allow for people to tell about seeing other people disconnecting from each other. 9. The Plaintiff avers that The Church of Scientology has a long-standing policy which enforces the "shunning" of any ex-members. All levels of association are affected by this whether it be casual, business, or even the shunning of those who were once close friends. If a Scientologist that is in good standing is "caught" associating with a "shunned" ex- member, they themselves can become a persona non grata. Therefore, any Scientologist who has either read or been made aware of the content of the libelous document would be compelled to discontinue or refrain from any business contact, including but not limited to the engagement of the Plaintiff's services as an actress, writer, producer or director. 10. The Plaintiff avers that she has already lost revenues from business formerly conducted with Scientologists who severed a relationship with the Plaintiff as a result of the libelous communication from The Church of Scientology. Does being fired by your Scientologist employer for refusing to do Scientology courses count as disconnection? I formally withdraw this question as the accounts themselves in the previous pages of this thread already answered it in the affirmative in terms of the context of adding names affected by the policy whether it be defying it knowing the consequences, acting to follow it irrespective of orders to do so, or not acting the way one otherwise would in fear of it. Carry on! it is another form case of disconnection of course. People you worked with you will no longer see, or your boss for the matter. But maybe just mention that in the intro too? it is another form of disconnection of course. People you worked with you will no longer see, or your boss for the matter. Workplace religious harassment, but not really disconnection. but they will no longer see and talk to the people they worked with or their boss? Isn't that another CASE of disconnection? Like I said perhaps mention in the intro? Gale Lyons was one who divorced her husband over Scientology. Their difficulties began after only her third class. "He wouldn't give me the money for it. So I took it out of the bank," she said. "We didn't talk for three months". After Lyons became a staff member, she made the more difficult move. "You have to believe in what you're doing to divorce your husband", she said. "It's been years, and it hurts so bad". You asked in TT if being fired was considered disconnection. Did you not? And I replied (obviously not to your liking) and then you started posting entries for those particular cases anyways. So..... if it this list is a list where you don't want others opinions about an entry, then just go ahead and do what you want. Like I said, you and Trev can do this list and ask each other. I helped out a bit, but this is the third time I have been more or less called out. So I will leave it up to you guys. Unless there was some relation with those people other than working at the same place, I don't see it as disconnection. That happened before I saw the second case which helped make my mind up, sorry that I voiced that reaction towards you when I should've been clear about how exactly I came to that, other than posting the cases. At the end of the day we're in agreement on it, which is a good thing. The driving force behind the firing is the disconnection policy in action. Let's not split hairs on the depth of non-work versus work relationships being the deciding factor. They're relationships being severed by a policy. I'm in the process of searching new names using a file Incred and I made and only now read up on this. For now I just want to say that this new project does not in any way make me less committed to the big list. In other words: I am not going anywhere. Last February 17, 2008, my daughter disconnected from me. Back in the 80's, I had been told to either disconnect from Mike Goldstein, or be declared. Well, no one was going to tell me who I couldn't talk to. You know what I chose, and I don't regret it for an instant. I could feel it coming, and I actually told my wife, who has never been in Scientology, almost to the very word what little sis' was going to say next. I want you to know I miss you very much. … Your aunts, uncles, cousins and brother also miss you. They all would like to see you again soon. It has been three years since we last spoke and I just can't understand how you can put the church before your father and family. #270 Diego Davila https://web.archive.org/web/2013063...na-davila-defy-disconnection/#attachment_8581 father, stepmother, brother, sister, father in law, mother in law, both brothers in law and some friends all disconnected. This one I got to work. If someone was fired because because the employer was ordered to disconnect for reasons outside the job, that that would be disconnection. I made a mistake. Please remove Estelle Baines. Though what she said on the link is very emotional, there is no actual disconnection story for herself there. I haven't found evidence elsewhere. I won't renumber previous post(s) but just use 291 another time. Scientology applying Suppressive Person Doctrine and Disconnection in Kazakhstan and against Kazakh citizens. While the Google translation is far from perfect, the relevant facts are relatively clear. Exclusive KZ: Scientologists, businessmen, deputies, prosecutors and private matter Nurali A. As it became known, our publication dated June 10, "Scientology in Kazakhstan" showed the leadership of the supervisory authority, and then search warrant "self Almaty Center" was issued on June 13 in the framework of pre-trial investigation in respect of its employees. Exclusive portal reporter recorded an interview with one of the affected Dina Tylevich. According to her, the other day, investigators seized a Scientology seven three objects "gazelle" of documents in paper and electronic media, as well as recording, "The E-meter" (similarity of lie detectors - Ed.) To the "confessions" of adherents of this cult. In total, it was seized in 2000 folders to be sent for examination. One of them was signed as "Nurali A" Scientologists hid carefully. For the half year stay with saentologo except for 120 thousand dollars given for getting super-powers, Dean lost in Scientology daughter Regina. Eighteen-year girl went to Scientology training in the US in May 2014 to an annual visa. When in December 2015, the couple went out of Tylevich cult daughter called him and said that he refused them because they are "suppressive person", the enemies of religion, which she chose. The girl lives in a two-year primary mission of Scientologists in the world, located in the United States (Florida, Clearwater). Regina, according to his mother, afraid to go home, because in the past year, her parents came from the Church of Scientology. Call the American mission to talk to the daughter - it is useless, calls the machine responds. Although Scientology has the right to exclude minors, if the issues with their parents "not settled", he says, they are antagonists. But in the case of Regina is different: it from the organization for some reason, do not rule. "I am sending Regina parcels, she wrote scouts are employees of special services abroad. They asked me to be quiet, because they have information that when parents are beginning to fight for their children, those secretly sent to numerous missions around the world, then they are simply impossible to find. Even if there is a mark in one country, it is to get permission to enter the mission, the child will forward to the next country, and so on ad infinitum. Even if to prove that the person sought has been in the mission, Scientologists will answer, they say, it is a free man and went wherever you want, without accounting to us. While those who escaped from the "Sea Organization" (US mission head Scientologists), they say that there are prohibited telephones and correspondence with relatives. Regina can not pay for their education in Scientology, and I do not send my money, so I believe that Scientologists hold it in America as a hostage "- said the mother deceived. How to tell the girl's mother, "the investigators showed to senior management how dangerous Scientology." "They are trying to delay to their senior politicians and well-known artists. On the sidelines of your stuff caused a great resonance. The prosecutor in the publication day gave the search warrant Scientologists. enforcement officers are afraid - after the publication of figures Almaty akim, who has no idea who the Scientologists, and they tried to use their photos with him. Baibek photographed Abdinova (head of Scientology Fund - Ed.) In 2010, and she became a Scientologist in 2011, he must have all the offensive "- shares his guesses Dean Tylevich. According to her, the investigator asked "not to raise the issue of the return of Regina before the investigative actions to be taken." "The investigation for some reason does not want to light the story of my girl, it is not clear - why. They keep saying, "Now is not the time", "this is our trump card", "they need to be a good catch." Sami security officers appealed to the US Embassy and our connected. Our bodies want to contact our Foreign Ministry, there have to write to America, that Regina is held in a criminal case, and then it will have to return home. In addition, Regina is in the US illegally on an expired visa, "- explained the details of Dean. More on Scientology applying Disconnection in Kazakhstan and against Kazakh citizens. "The worst thing is that I lost my daughter, Regina, her deception recruited to serve the Church of Scientology for a billion years, signed with me and my husband a contract. When we met with the mother of my husband Daniel, she invited us to her daughter Regina on OT is a holiday. The daughters then, in 2012, was 16 years old, she graduated from high school as "excellent" and wanted to enter the Medical Institute named after Asfandiyarova to save lives, "- she said. According to her, the festival she met with Scientologists-the same age, they told her that Scientology year gives supernormal conscious human control and treatment of his body that did not get over 10 years of higher education. "She showed films and videos about the past life and the various&quot; miracles "taken no worse than in Hollywood, in the end she believed in all this and began to ask for training to Scientologists in the United States, the city Clearwater, Florida. It is I have only daughter, a very intelligent, moreover Scientologists me convinced that it is not a religion but a science, and we do not have to give up Islam "- Dean added. The woman said that as a result of her daughter went to America in May 2014, and after she and her husband went out of Scientology, she called and refused them. "Leaving, Regina received a visa for one year, it has long been ineffective, moreover, it is our nationality, which may refuse only arrived in Kazakhstan. But Scientologists do not release it under any pretext. I hope now that the criminal case, it will cause in Kazakhstan through official channels as a witness or victim - still only be returned to me my daughter! "- Says the mother deceived. Sorry that I haven't been around much, real life taking over here. According to Tony Ortega's Russian translators (who I trust, and whose name translations seem consistent with the majority of Google translations), the names should be Danil Tylevich and Dina Tylevich. I guess that also means the father Danil can be added as "daughter Regina disconnected"
Somehow we'll get to 300. James Dries - shot himself to death–disconnection situation with one parent in, one out. Brand Pince - Ontario Canada, husband of Penny Pince (who died of cancer), a former mission ED, who killed himself by asphyxiation in his car, c.1979, overburdened by a huge S.O. (LA) and Mission freeloader debt to the Church, by medical bills, and by disconnection. His wife was Bob Mills' cousin. #295 James Dries - shot himself to death–disconnection situation with one parent in, one out. #296 Brand Pince - http://factnet.org/scientology-suicide-bob-mills Ontario Canada, husband of Penny Pince (who died of cancer), a former mission ED, who killed himself by asphyxiation in his car, c.1979, overburdened by a huge S.O. (LA) and Mission freeloader debt to the Church, by medical bills, and by disconnection. His wife was Bob Mills' cousin. This includes a screenshot from the actual disconnect. Plox to back it up. Al Bornstein is on the list, please add her current name Kate Bornstein (like on the big list). Do you guys already have this story on Hull's father? Wait no. Shereen is still in. She disconnected herself from her father. We don't add active scilons who disconnect. ETA: (bumps head against wall): we can add her father, as he is the one being disconnected from. ETA: (bumps head against wall): we might add her father, as he is the one being disconnected from. Might as he is not speaking out himself? Vote? No to the Big List, if he isn't speaking out himself. Maybe someone can get a statement out of him before he dies for the Big List? I just read he was in a coma. Someone reported they got an error when going to the Underground Bunker using a link on the wiki. When I click on some of the links on this wikia page (Lori Hodgson, Phil Jones, Marc Headley- for example), I get a "tonyortega.org 403 Forbidden Error Page" error message. The links that work point to sites other than Tony's site. I myself have the same problem. ETA: The problem doesn't look to be on Tony's end. When I use a link to go to an incognito window then it works fine. Looks like the last part of the parameter #post-4201 is the problem? Or missing www? The Bunker has a glitch that if there's an apostrophe in the URL of the referring page, it'll give a 403 Forbidden response. Ah, so it's literally the apostrophe in the wiki article title - Accounts of Scientology's Disconnection Policy - combined with the fact browsers include the URL of the referring page in the HTTP header being sent to Tony's site. I'll try some workarounds that don't require changing the title of the article for the sake of someone else's site being the cause of the problem. That option, instead of sending the full URL of a page, only sends the scheme+domain+port, i.e. http://whyweprotest.wikia.com in the referer HTTP header to Tony's site. Okay, workaround attempts #1 and #2 have both been stifled by the wikia platform itself failing to parse data: URIs into clickable links. This was an effort to still send the traffic to Tony's site minus the referrer HTTP header, and works from a normal HTML page, but I'm dealing with wiki markup here which thwarts that code. Workaround #3: all Underground Bunker links are to their Waybacked version until the glitch on Tony's site is fixed, after which this edit will be undone. O well. In May that didn't have much impact. So I tried myself now. Waiting for a big deafening silence... / Inb4 big list of additions. Wow. You got thru all the 'S's and I'm not there. Hey Cece, you're already on at K.
#304 Caroline Letkeman - http://www.forum.exscn.net/showthre...ction-Policy&p=1112181&viewfull=1#post1112181 Daughter Ann was ordered to disconnect from in 2001, and all her Scientology friends and associates disconnected. From another thread I posted. Russia TV 5 Investigation of Scientology. The date of the report is July 17, 2016. Use Google translation. There is also video at the link. The following short Google translated excerpt indicates that the Church of Scientology has exported true, on-Source KSW Scientology to Russia. The "here it is" refers to a letter being shown on the video. For example, Sergey Voldaev long time he spent with his mother in the church, decided one day to get out of it. He wrote a letter, here it is - the man says that his life the last few years has been a nightmare. Mother wrote in response to a denunciation son. And today she wants nothing to hear about his son. Dasas again at work. With the "raw material" - the so-called people who are in the process of treatment - it turns out. With "hot files" - those parishioners who at least once, but bought Scientology services - she is doing, on the contrary, not very. Head, of course, not happy, and so he sends it to the next training. Michael Kozin - the oldest and Honored Worker Church - explains how to behave with difficult clients. In this case, by any means necessary to persuade the person to come to the organization and buy service. In the sources we link to names are not always added. Should you want to go out protesting orgs or something then please be sure not to go at it alone. #306 Aharon Friedman - https://backincomm.wordpress.com/2014/12/09/exclusive-dror-center-vs-rcs-national-tv-coverage/ In the video at about 12:00 Son disconnected. Ofra, his wife, was also added, but she isn't featured in the documentary. I say we add her anyway? #307 Ofra Friedman - https://backincomm.wordpress.com/2014/12/09/exclusive-dror-center-vs-rcs-national-tv-coverage/ In the video at about 12:00 Son disconnected. Ann Catherine Keirns was also added while not providing links, please undo this. I could not find proof. Please add for Nan Herst Bowers (already on) that all three of her sons (Brad, Todd and Ryan Kugler) disconnected, and that she also doesn't see her grandchildren (7). Got this from her by PM. It would help if we add AKA Nan Kugler, her name while in. Will also post in big list thread. She's also duplicated under S as Cece (Kruchko) Smith. Removing that entry takes us back to 306. Trev, I sent you this message on FB yesterday. Here it is now. Let me know how to copy links to send you. This is to his FB page: https://www.facebook.com/richard.royce.75 but not sure if the posts are public. Thanks. I've had serious internet problems at home so I wasn't able to answer your PM. Richard's story on FB is open for everyone with a FB account to see. However, as FB is only available using a login, we copy a screenshot here. #308 Richard Royce - https://whyweprotest.net/goto/post?id=2591699#post-2591699 Two sons disconnected, one committed suicide. “Deep thanks to TrevAnon and Anonymous for compiling the names. And special gratitude to Phil and Willie Jones for the inspiration,” says our correspondent. I would like to print some of these posters. Please let me know how to get a good copy. Thanks to all for their work on this. or Cece Marie Gangle Smith on FB or here. 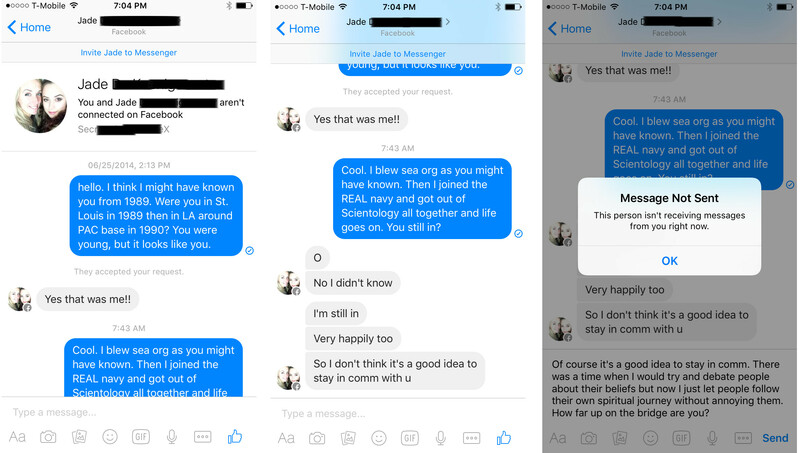 Decided to cut ties from her Scientologist mom because the threat of disconnection became exhausting. Feel free to use a better description. So... I guess Mariah Carey is now a victim of disconnection...? Today, Tony Ortega published two articles mentioning Kelly Jordan, Shelley Duvall, and Vivian Kubrick. AFAICT there is no disconnection angle there...? Vivian Kubrick did disconnect from her sisters. Marie’s is one of the more disturbing tales that we’ve heard, and we told her we’d be here when she decided she wanted our readers to hear what she’d been through. Tony's note in that story: "(We found only one reference to Aaron’s death online at all, in a website that collects the many cases of Scientology suicide. But it put his suicide in the “Holiday Inn” and in 2003.)" is referring to a page on the same wikia the disconnection list is maintained on. I've corrected his entry now. I guess my English fails me. But Viviane is already on? Should she be the sister? From what I get Virginia is the one who got in and disconnected. He never says this is due to disconnection. If his friend just joined the Sea Org that'd be enough for Andrew to "never see him again". There's that word "lost" again, which doesn't automatically mean he was disconnected from. As a never in, unless we find his name on the declared enemies list from 1991 he has to at least mention he was declared an SP for us to consider those "lost" to him have actually disconnected and not just become staff/Sea Org and moved into berthing or away from him closer to work those slave-like hours. Damn. The finer details of the English language keep haunting me. Good that you check though. Hey, what if I find and present evidence of a disconnection case in Dutch?! Cooper posts as Newcomer over on Mike's. As he tells he's declared I think it's fair to say she disconnected, or had to. Shelly is also on the big list so please include the broken heart there. Oh dear, this isn't disconnection, it's a stupid rule Miscavige had that people in RTC couldn't stay married to people not in RTC, and her husband hadn't left Scientology, he was in the RPF at the time. Insane conditions? Yes. Disconnection policy? No. Just checked to see if he was on. But...no. #320 Aaron Smith-Levin - http://tonyortega.org/2017/01/03/to...ow-families-get-so-screwed-up-in-scientology/ Disconnected from twin brother. I'll use a link to the episode which covers both details. This is the story of the last 4-5 years of the subtle coercion and lengths the church will go to, to enforce disconnection of families and friends. I will say it felt like mental torture and being put in a situation of making a Sophie’s Choice between your children. I will also liken it to the term “gaslighting” which perfectly explains how I felt during this time period. (Gaslighting is a form of mental abuse in which information is twisted or spun, selectively omitted to favor the abuser, or false information is presented with the intent of making victims doubt their own memory, perception, and sanity). It also shows that the church absolutely lies that disconnection is not enforced. This was reinforced by the lawyer Monique Yingling, a spokesperson for the church who was on the 20/20 episode which just aired on ABC last Friday night – she stated that a person is ONLY declared if they speak out against the church. This is an ABSOLUTE LIE. My story will show you that it is a lie. There are some names from the first Disconnection Billboard campaign. Dr. Mark Haffenreffer, Hartford's father, might be listed instead, since I'm not sure if Haines is related. Hartford Haffenreffer, IAS Patron, brother of Anne Haffenreffer (deceased), son of Nona Gainsforth Haffenreffer (deceased) and Dr. Mark Haffenreffer. Obituaries for Hartford's and Mark's family members both include Mark's name, and identify Hartford as a son and brother to his parents and sister. Sister was afflicted by Rett Syndrome, a severe neurological disorder (possible source of conflict with MD father?) Comment by Caroline Haines attests that Hartford's father is disconnected from his son. I thought I'd give the screenshots for the questionable comments and Trev can decide whether any of them are worth pursuing any further. Lisa Tighe - says she misses Natalie Weber, who does not appear on the Services Completions website. Relationship unclear. Shannon Caldwell - statement implies she is disconnected; name not given. Jane Jones - parents unnamed, unclear that disconnection occurred. Please also change entry on the big list. I guess the question is, if giving to the billboard campaign qualifies as saying the loss of a loved one was because of disconnection. #325 Nancy Milner - https://whyweprotest.net/goto/post?id=2600779#post-2600779 Lost son and his wife. Has never seen her grandchild. I don't doubt Haffenreffer was in (though that is not a criterium for being on the list) but he doesn't speak out himself. H Pavels indeed not a full name. Shannon Caldwell too much of a stretch for me as it doesn't say who she lost contact with. Just to be clear, Hartford Haffenreffer is the son, who is in Scientology. Dr. Mark Haffenreffer is the father. I think the son in Scientology disconnected from the father, making the father the victim of the disconnection. If the criterion for being added is that the victim needs to speak out himself/herself, then I agree that Dr. Mark Haffenreffer should not be added. I hope the father speaks out, because the research I did for that one was compelling, and sad. Jenny Ellsworth - asks mother to call and donated to Disconnection billboard. Shitposting about Mike and Emily removed, as will all further shitposts about Mike and Emily. You went too far this time sonny. and her sister. A twin I think? IDK. Didn't she try to do a wellness check on her at Gold Base year ago? Or do you already have her sister listed? In 2014, Júlia Bertók and Eva Bertók were posted in OPS in CMO Bureau 7 of CLO Copenhagen. Is "Mr." some sort of title? In the wog-world its typically short for "Mister" but quite a few of these "Mr."s seem to be Misses or Mistresses. In the Sea Org an officer is referred to as "Mr." (pronounced "mister") even if the officer is female. So the non-Mr.s here would be non-officer sea orgers? Or non-sea orgers? Non-officer Sea Orgers. Everyone on staff at at CLO is a Sea Orger. I have not seen LRH in*11,337 days. I'm lazy. Deal with it. Looks like right now you're the only one hunting Incred. You're a real soldier, Incred. But it's soooooooo easy when daddy just drops the prey right in our laps. his disconnection story was on the Tampa Bay Times Truth rundown report, but I can't seem to find it. Say, a father and his daughter (who is married with kids) are ALL OUT of the cult. However, the mind control is still deep, and they still believe in the tech and all that. The daughter tells her father that he cannot see his grandchildren unless he does some crazy scientology steps like A-E or whatever. Would the father be a victim of disconnection and qualify for the list? I tend to think that it is a family dispute like there are so many others where people don't see each other because of some stupid rule (religious or not). However heartbreaking the situation may be. But I may be wrong. The case also shows how deep the mind control can get. It may also give the COS an opportunity to say "see, people choose to disconnect themselves, we told you so". Ginny Flahive - http://www.mikerindersblog.org/valley-otc-minutes-seconds/#comment-182758 Husband divorced her because he "couldn't be married to a non-Scientologist"
Not sure if it qualifies as a disconnection case, but I tend to think it does. His ex-wife keeps his son from him. Plox to correct spelling, David Kahn, not Khan. Sorry that's manipulation of two Sea Org staff just "because they can" which is an abuse of power, especially moving one to another country, but since both remained in, it's not an example of the disconnection policy in action as it's written in that post; no mention is made of which one disconnected from the other, or whether both were made to write each other disconnection letters. I just saw the episode. In it, Christi tells about her mother sending her a disconnection letter. So there's #355. Computer problems here, I may be around, I may not. So we are at 357 now? I have filed a Motion in Family Court that will hopefully grant an Order restricting my COS ex-wife from making my 12 year old daughter participate in any COS training, activities and involvement. The case will be held in San Diego in early December. In the last 10 years I have had to go to Court over 20 times to protect my relationship with my daughter, had to have the Courts intervene when my daughter disappeared, had to get Court Orders for Education, Medical treatment, phone calls, communication, visitation and was even falsely accused of neglect and sexual abuse on my own child. Now it is time to go after the source and I need your help. I am asking you to sign this Petition to be presented to the Family Court Judge, as they say, there is Power in numbers and I want not only the Judge to see how many people support my decision, but also want the ability to show how strongly the Public feels in regards to and with their own knowledge and experiences with the Teachings of L. Ron Hubbard and how greatly they affect the family units and most importantly, the children. Today, it is MY child and I want to protect her. I have filed a Motion in Family Court that will hopefully grant an Order restricting my Scientologist ex-wife from making my 12 year old daughter participate in any Church of Scientology training, activities and involvement. The case will be held in San Diego in early December. In the last 10 years I have had to go to Court over 20 times to protect my relationship with my blood daughter, had to have the Courts intervene when my daughter disappeared, had to get Court Orders for Education, Medical treatment, phone calls, communication, visitation and was even falsely accused of neglect and sexual abuse on my own child. Now it is time to go after the source and I need your help. My non-adopted step daughter disconnected from me almost 10 years ago and I don't want this to happen to my own flesh and blood. I am not asking for a lot, just a dollar here and there that can help us hire or consult an Attorney experienced in this realm of abuse and help with the Legal costs of taking on such a Monster. We have already had a ton of support and I know that my heart is in the right place and it is the right thing to do, but I had no idea of how expensive this might turn out to be. Finding an Attorney that is willing to take on the COS and protect my daughter has been like pulling teeth with no pain killer. Pride is everything to me, but unfortunately, I need a little help and I don't think I can do it alone. Yesterday on Facebook, Michael Creger mentioned that he got a call from the Dr. Phil show asking him to do an interview. He later added that he had "not agreed to it just yet", and then posted "Looks like we are going to trial on the matter." Today's court appearance was short-lived. I have a contemptuous issue to resolve with the COS ex and of course, I petitioned the courts to PREVENT my daughter's involvement with the COS and to force the COS to cough up her file. The COS ex's Attorney pled "Not Guilty" to all issues and refused to give me anything. Not the short win we were looking for, but the Judge gave us something even better, a trial. She wants to hear what I have to say about the COS! I only have a few weeks to prep, gather evidence and bring in witnesses, but I am so freaking excited to be able to stand in a Court of Law and put it on record all of the COS BS we have suffered through. Anyone that wants to come forward on this task is more than welcomed! Oh, and I wonder what the COS is going to say about their precious Clear having to go to a Criminal Trial? So, does this guy count as having a disconnection story? Probably not. The order of events has her cutting him out of her life while he was in jail, before she even joined Scientology. Have to agree with Incred here. Thanks for suggesting though! Boy was I wrong. Happy to have been very wrong here though! Of course I can't take credit for Leah's show, I understand that very well. But I keep thinking our work ITT contributed to - at least - successfully pitching the idea for the show to A&E. After that I'm sure the production team did their own research. I don't think it will generate much publicity outside the community. The best we can hope for is a blog post by Tony or a tweet by Leah. Ok enough of that. Back to work. She says she was in. If there's evidence she was in she can also be added to the big list. Someone can now make a calendar with a disconnection story for every single day of the year. Damn, didn't even think of that when posting the count. More than a year ago, in January 2017, we wrote a story about Bernie Headley that got us pretty worked up. Here was a man who was fighting cancer and was being prevented from seeing his own daughter, Stephanie, by the Church of Scientology. We’ve written about Scientology’s toxic policy of “disconnection” for many years — it’s Scientology’s horrific form of extortion that is central to the way it rules its membership through fear. Specifically, the fear of being separated from loved ones. Because Bernie is attached to his son, Marc Headley, a former Scientologist and member of the Sea Org who is an outspoken critic of the church, he can never again see his daughter, who remains in the church. After that story was published, on February 4 last year, we started a new feature which now appears at the end of every story we do here at the Underground Bunker. We made a list of people we’ve written stories about who are being kept from loved ones by Scientology’s policy of disconnection, and we keep track of how many days it has been since they saw their son or daughter or mother or father that has been taken away from them. For our readers, it’s a constant reminder of what this organization does to families as it maintains its ruthless control of members. But for the people in it, it’s a daily nightmare that never goes away. We thought we’d ask them how they manage to cope with that ever-increasing number of days since they were separated from people they love. Last week, we asked the people on our “Scientology disconnection, a reminder” list — which appears at the end of each story here at the Bunker — about how they are coping with the church keeping them from their loved ones. The result was an emotional outpouring from the people on the list and from the readers of this website. Two responses came in late, but we thought they were worth posting on their own. Again, as you read these, keep in mind what the victims of Scientology must endure every day of the week. Valeska Paris recently posted a crushing note on Facebook about her stepmother, Angela. We asked her if she wanted to write a more lengthy piece for the Bunker, and we’re very glad that we did. Thanks for that, although she's already on the list as Valeska Guider. We're relying on his email address for last name, and she doesn't explicitly say she is "disconnecting" from him..
"I do not want you to contact me anymore." is good enough for me. Just a euphemism for disconnection I think. My main concern was getting his name wrong based on the assumption the email address is his. Or my grandma eloveland@aol.com since she paid for it. So no dice on adding him without being certain of his last name (she could be his mother's mother then Loveland is his mother's maiden name and he most likely share's his dad's last name), sorry. Full name of the father wasn't given so we can't list his name. I, Heath Douglas Creer, do swear that I disavow and thoroughly disassociate myself from any covertly or overtly planned association with J. Roscoe Creer and Isabel Hodge Creer or anyone demonstrably guilty of SP acts as described in HC Policy Letters March '65. I understand that any breach of the above pledge will result in me being declared a Suppressive Person. *Signed*, H.D. Creer.